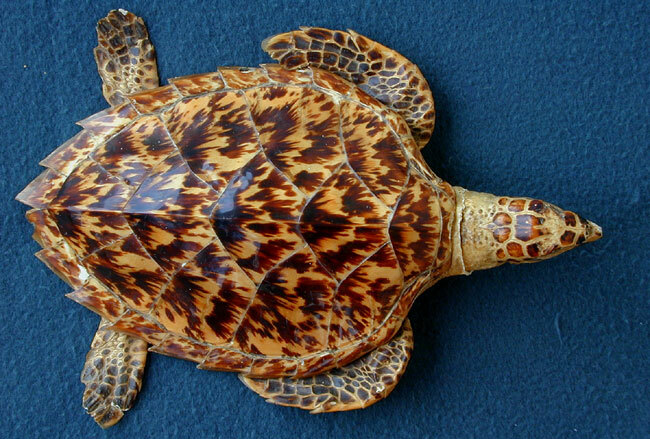 Of the seven species of sea turtles the hawksbill is distinguished by its beautifully mottled, brown carapace. The unique pattern and coloration of their scutes has, unfortunately, resulted in them being one of the most poached sea turtle species. Currently they are listed as critically endangered. These animals are harvested for products made from their shells and are no longer found anywhere in large numbers. 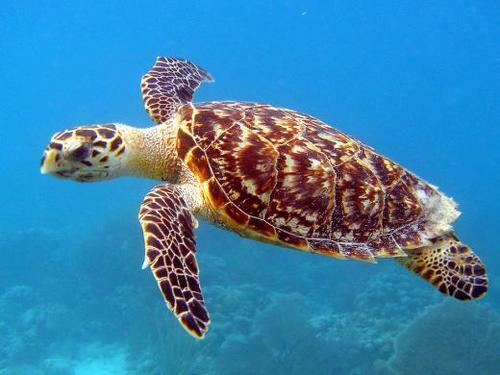 The hawksbill is a tropical species, nesting mainly in the Caribbean. During non-nesting seasons they are highly migratory, found traveling in the Indian, Pacific, and Atlantic Oceans. 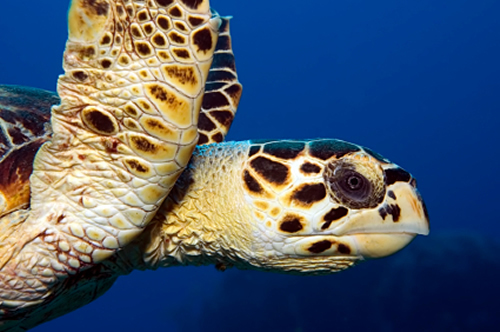 Hawksbill reach maturity at around 30 years, but as one of the smaller species a full grown adult is typically only 3 feet in length and weighs around 120-180 pounds. Their small size and sharp saw-like shell edges allow them to climb onto rocky beaches and cut through vegetation to reach prime nesting locations. There tracks are asymmetrical because there land crawl is an alternating gait. Hawksbills mate biannually, typically nesting every 2, 3, or more years laying 2-4 clutches of 140 eggs each nesting season. Hatchlings surface after a 2 month incubation period and emerge at night. Their heart-shaped carapace is dark in color and these tiny turtles are only 2.5 cm in length and weigh less than 1 oz. While they are omnivorous, their diet consists mainly of sponges which are benthic invertebrates that live on coral reefs. Sponges are made up of tiny spicules consisting of silica, which is the main component of glass. Therefore, these turtles must have a tough digestive system! Their narrow head and serrated birdlike beak are perfectly evolved for feeding in the tiny crevices of reefs. When not feeding they are often spotted resting in caves on the ledges of a coral reef systems. Tune in next week to learn about the green sea turtle!